The three health promoters in the village of La Patria — Candelaria Chumacero, Martha Hurtado and Celia Porco — are committed to making La Patria a healthy community! The women first enrolled in the community health promoter program three years ago. 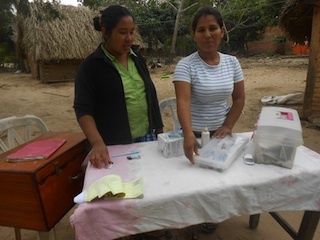 During the first year, the women managed a first aid kit providing their community access to basic medications such as pain relievers and antibiotics. Since then, with your support, their health kits have continued to grow. They now have access to specific medications and instruments to meet the needs of their community — medications for high blood pressure, pregnancy tests and birth control, materials to cure deep wounds and even instruments to attend births in emergency situations. This past month a local villager from La Patria, Sr. Reynaldo Canedo (nicknamed Cuco), had an accident in the sugarcane fields that left him with a serious wound in his leg. The accident happened over the weekend when there were no doctors in the surrounding area. Cuco sought the help of the health promoters. The women cleaned and stitched the wound using supplies from the first aid kit. The promoters have continued to make follow-up visits and are proud to report that the wound is healing without any complications or infection. When Gus and Elena set out for their journey back in May, they chose to make their hike more meaningful by raising money to provide villages in Bolivia with the very things they had to sacrifice during their hike — one of those being access to medication and supplies. Gus and Elena’s dedication coupled with your generous contributions have improved the health in the village of La Patria. Thank you for inspiring Gus and Elena to go the extra mile….thank you for the impact you have made in rural Bolivia!